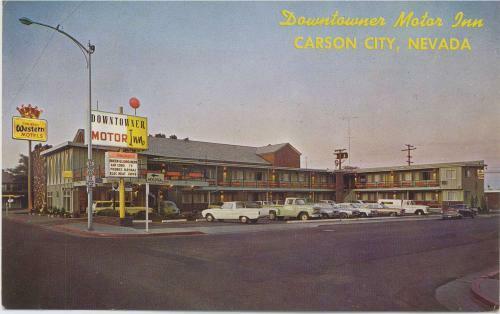 With the recent news that the Downtowner Motor Inn in Carson City may have new owners soon, Joe Childs was good enough to send in a scan of another old postcard of the motel. 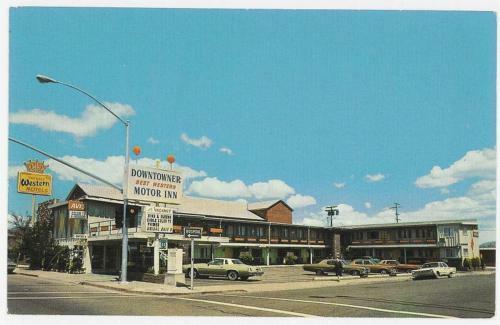 This one is dated 1969, and shows the motel when it was only seven years old. This dusk shot almost makes the place seem inviting. The glow of the sign and the porch lights, as well as the Best Western crown, seem to have pulled in a lot of customers. 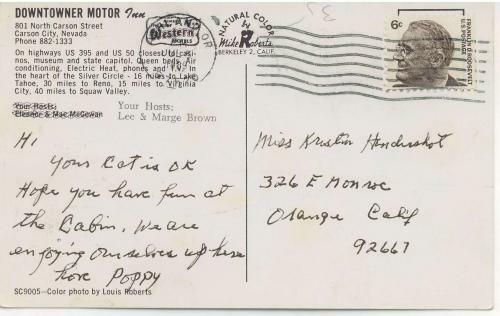 Joe scanned the back of this one too, showing the message from “Poppy” to Miss Kristen Hendershot of Orange, Calif.
And here’s another Downtoner postcard that was added to the collection a little while ago. This one is a daytime shot.